The Managing Director of nearby Tomatin Whisky Distillery, Tom McCulloch, was so impressed by the team effort that went into the snow clearing over the week from January 12th to 17th that he commissioned forty eight bottles of finest blend Scotch Whisky, named Big "D" , to mark the team's efforts. The commemorative bottles have now been presented to CairnGorm staff and organizations who took part in the massive dig out operation by Graham Nicolson, Tomatin's Regional Sales Manager. Every bottle is individually numbered and contains a blended Scotch whisky of Highland blend. "I was talking to Dr Mike Langran, who is often on the hill assisting ski patrol at CairnGorm Mountain and gained an insight into just what efforts were being made to get the ski road and train ready to receive the public. It was a team effort on a huge scale involving paid employees as well as volunteers and contractors and it reminded me of the sense of community which is very much part of Tomatin Distillery's heritage - one worth acknowledging and celebrating". said Mr McCulloch. 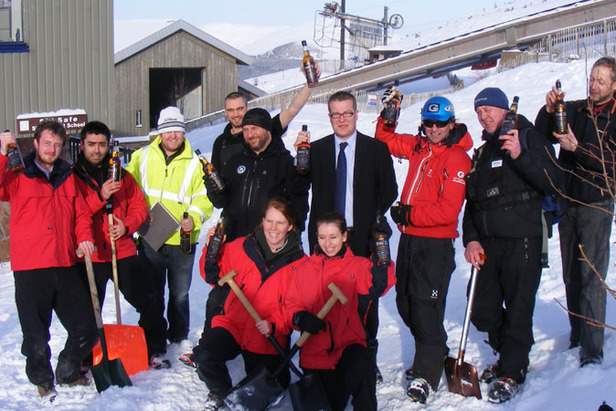 "This generous and unexpected gesture from Tomatin is hugely appreciated by all of us who work at CairnGorm Mountain." said Ian Whitaker, Chief Executive at CairnGorm Mountain Ltd. "Like employees at the distillery, many of CairnGorm's staff have made a lifestyle choice to work in this environment and it is a way of life for many of them. Running a ski centre on a Scottish mountain side presents huge challenges at times and it is not often that the effort that goes into getting lifts and tows up and running is so publicly recognized. I would personally like to thank all the staff, volunteers and contractors who have gone above and beyond the call of duty in these past few weeks and to Tomatin for recognising those efforts with this gesture.". As well as staff form CairnGorm Mountain, volunteers from local businesses including; The Ski School, G2 Outdoor Activity, Cairngorm Mountains Rescue Team were assisted by local contractors, Jerry Job and Allan Munro Construction who provided heavy plant to assist with snow moving. Conditions remain great for skiing and boarding and CAirnGorm Mountain are expecting a busy half term holiday period.